Dennis Gartman, the publisher of The Gartman Letter, had said that one should be patient throughout the lifecycle of the trade, during entry, while holding, and exit. 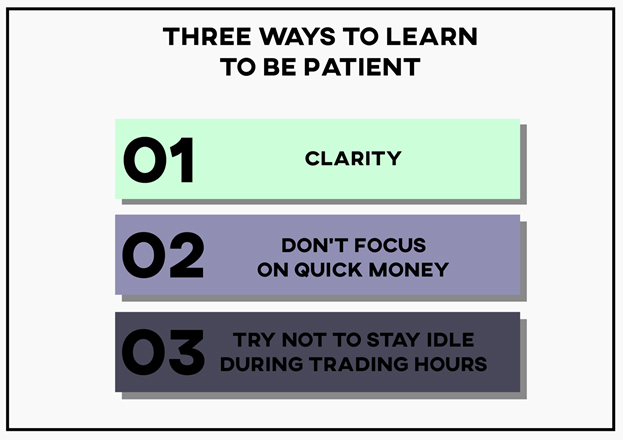 Patience is an essential trait needed for a trader to be successful. Still, most individuals lack it. Dennis Gartman, the publisher of The Gartman Letter, had said that one should be patient throughout the lifecycle of a trade, during entry, while holding, and exit. People do a lot of research and come out with a plan and trading strategy. They might have some number in their mind regarding entry and exit point. However, when this anticipation does not work as per plans while trading live trading, people get into panic mode and take decisions that result in minimizing the desired output or sometimes in disaster. Continuing this, in the long run, will ruin the career of any stock market trader. Being impatient is catastrophic in the trading industry, and hence, emotional instability must be avoided. One way to control impatience is to be disciplined during trading. Stock trading is perceived by most people, especially ones new to this field, as a route to earn quick and huge money. They initially work hard on understanding and creating many approaches to actual trading experience. Here is the catch, even the best strategy can only be successful when the person using it has the patience to give it enough time to work. The financial market works mostly on human sentiments. The stock market in India goes down due to some events in other parts of the world which may not affect us directly. For example, during the Brexit referendum’s voting day, the stock market went down in anticipation that vote for Brexit will affect Indian companies in Europe. Many people out of impatience and panicking sold their stocks, resulting in the downfall of the share market. However, in the actual scenario, it was only a vote, and any consequences due to Brexit will just be felt after two years when it will be implemented. People who were patient enough did hold on to their stocks, and sharemarket became normal next day. People who sold their stocks due to edginess minimized their profits. Anyone investing in the share market should be very clear and focus on the pros and cons of the trade. Why does one decide to buy a particular stock? One should do a complete analysis of the security and stay updated about happenings related to it. This will boost the self-confidence and lessen the effects of impatience. Money is the primary aim of entering into any trade. However, when the concentration is only on earning easy money, it turns fatal. Hence, if one is always thinking about money, emotions are bound to take charge. It is, therefore, suggested not to ponder upon quick money during trading. Staying idle during trading hours leads to adverse and wrong decisions. It is here where impatience is generated at the highest level. Hence,, keep yourself busy with other research or work if you want to avoid taking hasty decisions.